Melville, NY – Nikon Sport Optics has unveiled its newest and most anticipated addition to its successful Fieldscope line. With a combination of Nikon’s existing legendary optical features and newly innovated revolutionary Fieldscope technologies, Nikon is proud to present the new line-up of MONARCH Fieldscopes. flagship MONARCH product family name to a Fieldscope. As successor models to Nikon’s state-of-the-art ED82/EDIII Fieldscopes, MONARCH Fieldscopes have a first-rate optical system and are being offered at a price point that is virtually unrivaled for this level of optical quality. 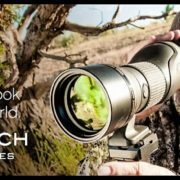 Designed with the needs of adventurous birders and wildlife viewers in mind, MONARCH Fieldscopes offer a high-end optical experience at an affordable price.The innovative technologies Nikon has introduced to its new Fieldscope family are what make the MONARCH Fieldscopes unique. An Advanced Apochromat Optical System with ED (Extra-low Dispersion) glass minimizes color fringing to the furthest degree across the entire light spectrum visible to the human eye. This cutting-edge lens technology and refined optical design work in synergy to eliminate color fringing and deliver an incredible resolving power. A multilayer coating is applied to all lens and prism surfaces, allowing maximum light transmission. The result will help viewers contrast the slightest variances of the color spectrum, delivering a crystal-clear image at long distances.Nikon’s new Field Flattener Lens System is also built into the design of MONARCH Fieldscopes. Curvature of field is an aberration that occurs in optics when focusing on the center of the field of view, causing the periphery to go out of focus and vice versa. The MONARCH Fieldscopes’ Field Flattener System helps to resolve this viewing obstacle. This advanced lens system provides consistent, edge-to-edge sharpness while compensating astigmatism and coma aberration at the same time. This technology enhances the edge-to-edge field-of-view at any magnification for any viewing distance. MONARCH Fieldscopes feature Optimized Focusing System. This new focusing technology provides different focus speeds that allow the viewer to acquire and identify objects faster and easier than before. The focus ring of MONARCH Fieldscopes provides two focusing speeds for optimal operation: fine focus adjustment for distant subjects and coarser adjustment for nearby subjects. A knurling texture on the oversized focusing ring assures incredible gripping of and accessibility to the focus ring, whether using bare hands or thick gloves in very cold conditions. Engineered with highly robust aluminum alloy, the incredibly rugged designs of MONARCH Fieldscopes are built to partake in any adventure. Each model is waterproof*, sealed with O-rings and packing seals. Also, they are all purged with nitrogen gas to prevent fog due to sudden temperature changes. In addition, a built-in sliding hood blocks harmful light to the optical system and protects the objective lens. MONARCH Fieldscopes come fully protected for life by Nikon’s No-Fault Repair/Replacement Policy. Customers will have the choice of 60mm or 82mm objective sizes and a straight (S) or angled (A) Fieldscope body. MONARCH Fieldscopes come with MONARCH Eyepiece (MEP) 20-60 (20-60x w/ 82 series and 16-48x w/ 60 series). Two additional eyepiece options are MEP 38W (38x w/82 series and 30x w/ 60 series) and MEP 30-60W (30-60x w/ 82 series and 24-48x w/ 60 series). Each MONARCH Fieldscope Eyepiece employs Nikon’s innovative Advanced Apochromat Optical System and Field Flattener Lens System Technologies. All eyepieces feature a Type 1 Bayonet Mount for swift attachment/detachment. *The product will suffer no damage to the optical system if submerged or dropped in water to a maximum depth of 1 meter/3.3 feet for up to 10 minutes (NOT designed for underwater use). For more information on Nikon’s full line of, Binoculars, Fieldscopes and Laser Rangefinders, please contact: Nikon Sport Optics, 1300 Walt Whitman Rd., Melville, NY 11747-3064, or call 1-800-645-6687.